French architect Manuelle Gautrand has designed the ultimate showroom on the Champs-Elysées in Paris. The new Citröen Flagship Showroom is located on the same spot as the 1920s company headquarters, designed by André Citröen himself. The architect has created a bold new building that successfully expresses the distinctive design of the brand in architectural terms. A notable and eye-catching feature is the filigree façade, which consists of overlapping glass pyramids reminiscent of Japanese origami techniques. The only use of colour comes in the form of red accents, used prominently in the façade of the building and selectively in the interior. 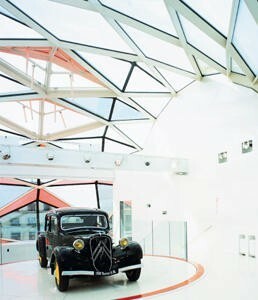 Here the cars are displayed on a series of stacked, circular pads, filling out the sculptural fabric of the building. A central mast rises up to the full height of the space, containing suspended and rotating platforms to display cars and concepts. The ceilings are made in PVC, cut out in a triangular form and each triangle has unique dimensions. The ceiling was conceived to precisely form a unique whole from the elements of a giant puzzle. The result takes brand design to a new level of elegance, subtlety and energy.